These Vegetarian Swiss Chard and Pinto Bean Burritos are the ultimate in meatless meal Tex-Mex comfort food. Stuffed with brown cilantro rice, lots of melty cheese, diced avocado, and a smokey chipotle swiss chard and pinto bean filling, they are super satisfying for even the most avowed meat-eaters! Combine 1 1/4 cups of the broth, the brown rice, half of the garlic, and 1/2 teaspoon of the salt in a small saucepan over medium-high heat. Bring to a boil, then cover and reduce the heat to low. Cook for 45 minutes, until the rice is tender and the broth has been absorbed. Remove from the heat and let sit, covered, for 10 minutes. Add the cilantro and fluff with a fork, then cover and keep warm. While the rice cooks, heat the oil in a large pot or Dutch oven. Add the chopped onion and cook until it softens and just begins to brown, about 5 minutes. Stir in the tomato paste, chipotle, cumin, oregano, remaining garlic, and the remainin 1/2 teaspoon of salt, then cook for 1 minute, until fragrant. Add the chard and 1/2 cup of the broth, then cover with a lid and simmer for about 15 minutes, until the chard is tender. In a medium-size bowl, coarsely mash half of the beans with the remaining 1/2 cup of browl using a potato masher or two forks. Add to the pot of chard and cook, stirring frequently, until the liquid is mostly evaporated, about 3 minutes. Remove from the heat and stir in the lime juice and remaining whole beans, then cover and keep warm. Adjust the oven rack to be 6 inches from the broiler element and heat the broiler. Warm the tortillas so they are pliable by microwaving them in a stack between two damp paper towels for 1 minute. 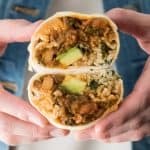 Lay the warm tortillas on a clean surface and divide the rice, chard-bean mixture, shredded cheese, and avocado evenly between the tortillas, mounding in the middle close to the bottom edge of each tortilla. Working with 1 tortilla at a time, fold the sides of the tortilla over the filling, then fold the bottom up, tucking it over and pulling back on it firmly to tighten around the filling. Continue to roll tightly into a nice, secure burrito. Place seam side down on a foil-lined baking sheet. Repeat for each burrito. Sprinkle the remaining 1 cup of shredded cheese over the burritos, then place in the oven under the broiler for 3 to 5 minutes, until the cheese is melted and starting to brown. Serve warm. If you aren't concerned with the burritos being completely vegetarian, you can substitute chicken broth instead of vegetable broth. Leftover chipotle chilies in adobo sauce freeze well to be used at a later date. Just dump the remaining chipotle chilies and sauce into a freezer-safe ziploc bag, flatten out, and freeze.